BrassCraft 48" long 3/4" ID (7/8" OD) Coated Gas Appliance Connector. ProCoat technology provide unequaled corrosion resistance. 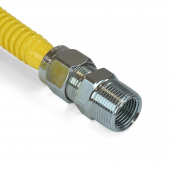 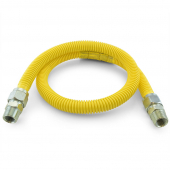 For use with indoor and outdoor connections of gas appliances to gas piping system. Flow Capacity for LPG/Propan (Straight Length): 344,000 BTU/hr.